Home / family / Do you have unresolved pain that is effecting your relationships? Welcome to the Relationship Restoration series. My name is Jodi Harman and I am so glad to have you all joining us today. 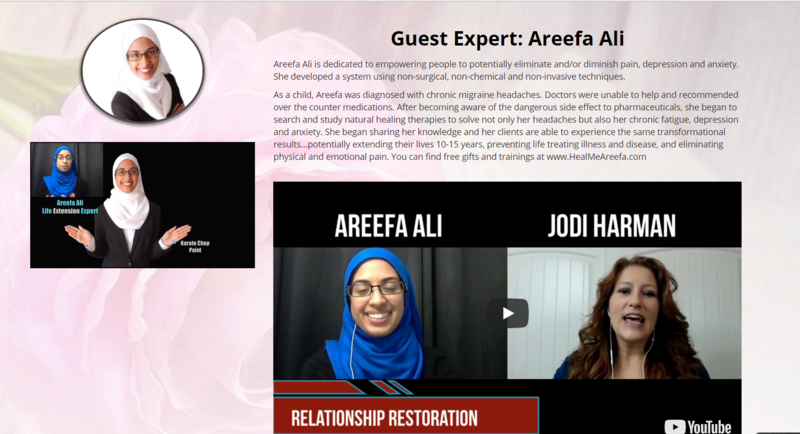 Today I have my special friend with us, Areefa Ali, from Canada and she is a powerhouse woman who I have met probably about a year ago now, well within the last year and she is amazing at eliminating physical pain and emotional pain such as depression or anxiety. When you’re in pain, it affects all relationships. During the holidays it can be a very stressful time and Areefa is going to show us how to get through it and make it better when these stressful times happen. This whole series is about how you can deepen and strengthen your relationships. I am so glad that Areefa is here with us because I don’t know about you, but it kind of feels like that time has already started and it’s getting crazy already. You know it’s just … I don’t know if it’s this time of year, I’ve got too much on my plate, and I just feel like I’m juggling, but sometimes I just feel like I don’t really know what direction I’m going in and when I hit my pillow at night, I’m like boom out like a log and I wake up in the morning, boom ready to go. I don’t know about the rest of you, but that’s how I’ve been rolling lately and so I just thought it would be fun to get a whole bunch of my friends who are all of these amazing speakers and mentors from all over the world and bring them to you so you can learn how to strengthen your relationships and make your relationships better this time of year. So, Areefa welcome and I’m so glad that you are joining us. Areefa tell us a little about you. Why tapping? Tell us about that. I don’t know, but I’ve had a couple of sessions with you and you kind of like work your Areefa magic, I call it, on me. I know that’s not what it is, but it kind of just … When I’m done I just feel like so relaxed and emotionally together that I’ve just kind of love everybody again. I don’t know. Does that make sense? That’s kind of how I feel after we’ve talked for a little while and I just know that what you do and how you do it with me and make me feel when I’m done is something that other people need especially this time of year. So, kind of tell us a little bit about how you got started and why you do what you do. A little about Areefa Ali during this time of year, I know that it can be stressful. As soon as the Christmas music hits the malls, you know everybody is running around trying to get their shopping list done, trying to manage their kids throwing tantrums in the store. I feel you. I feel you. I have a three year old. 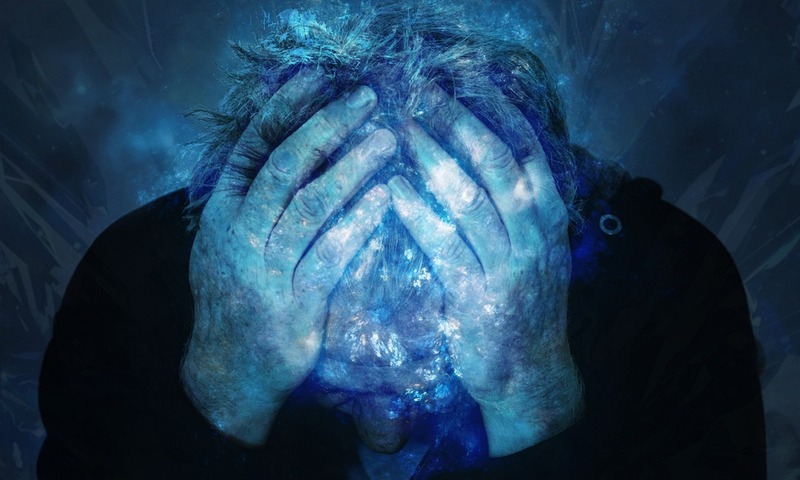 But my story started when I was 12 years old and I was diagnosed with chronic headaches, chronic migraine headaches and they were a force of nature. The doctors really couldn’t do anything for me except prescribe over the counter painkillers for me. Once I became aware of the side effects I just wanted to find a natural solution to my pain. Along the way I struggled with depression and anxiety and I found a proven process, three simple steps that actually was noninvasive, non-chemical, nonsurgical that potentially eliminated my pain and it started working for others as well. So, I’m absolutely excited to be sharing it with you today. Tapping works by using the body’s own ability to heal itself and I love the look on people’s faces when it works just like that. They’re shocked and I’m shocked. We’re all just having a really good time and I’ve used it not only on adults but children too. So, this is a tool that can really come in handy during this holiday season and I’d love to take you, Jodi through the process if you’re open to it. Using the process on children: I was taking my grandson to the store and I don’t know why I did that, but anyway. Long story. We went to the store together and all of a sudden, we were doing great. He was putting stuff in the cart for me and I turn around and he’s throwing a fit in the middle of the store. Everybody’s looking at me. I’m just like, “Okay, this hasn’t happened in a long time. I’m just gonna wait till you’re done.” I didn’t know. I think he was kind of like overstimulated. So, I’m really excited that if you can, if this will work on him too. I didn’t think about using it with little kids that this can really help them too. So, I’m really excited about that because I don’t want to do that again. That was kind of embarrassing. Areefa Ali’s example: It works on children. I was visiting my family during the holidays as well and my nephew, he was six years old and he was complaining of stomach pain. I said, “Hey. You want to do something?” He was like, “Sure.” He’s hopped up on sugar. I started showing him how to tap on these acupressure points and within a few moments, I asked him, “How’s your stomach doing?” “What? I’m fine.” And he started bouncing off the walls again. So, maybe it just works. Tapping stimulates these acupressure points and these acupressure points are based on Chinese Meridian points. So those were discovered over 2,000 years ago and it rebalances the body’s energy field. It rewires the brain. It lowers the amount of cortisol which is a stress hormone that your body releases when it’s under stress and it causes this relaxation affect. So, it just shifts you on a physical and emotional level and you just feel just this breath of relaxation, just this relief and piece of mind and clarity. It’s a form of Chinese medicine, so you know, you constantly think of these other things. So, those people who don’t know what we’re talking about is, no, it doesn’t’ really hurt. You walk us through the whole thing and you don’t have to be perfect at it. That was the thing because you’re like, “You kind of need to move up a little bit.” Then I did and I was like okay. So, anyways. So that’s kind of exciting. Areefa refers to it as acupuncture without the needles because what you’re using is your finger tips to tap on specific points on your body and it’s okay if you get them a little bit off because you’re tapping in the general area and the vibration from your fingertips is vibrating that section and it’s able to receive that energy point. Rate ourselves on a scale of one to 10 on how stressed out you are or how much pain you’re in. So, if you’re in physical pain or if you’re experiencing physical pain or emotional pain such as depression, anxiety, or stress rate yourself on a scale of one to 10 and write that number down. So, right now Jodi, tune into your feelings and what are you feeling? What are some of your stressors? Identify: What do you feel is the biggest stressors right now? You mentioned managing, the holiday season as well. Stress Identified as: tap on juggling it all and dealing with the stress of the holidays. The first thing we do is we start with a setup statement as we tap on the karate chop point, that is the fleshy part of your hand, right here, where you would just go hi-yay, karate chop. So, you could tap like this, you could tap like that. Whatever you feel is comfortable for you. So, as you start tapping here, we’re gonna set up the … Tell the body essentially what we’re tapping on, what area of stress we’re focusing on, what area of pain. So, the setup statement is as follows, “Even though I feel like I am stressed out juggling so many responsibilities, I completely love and accept myself.” So, go ahead. Fill in your own words and repeat that three times as you tap on the karate chop point. State as you tap: Even though I’m feeling stressed out and juggling too much responsibility, I completely love and accept myself. – State 3 times as you tap. Note: The words don’t matter. What matters is that you tune into the feelings, the emotions that are holding you down, like if it’s stress, pain, anxiety, depression, or fear. The first point is right at the crown on the top of your head, just the very top and that is the head point. The next point is the tips of where your eyebrows start. So, that’s the eyebrow point. The next point is the outer corner of your eyes, right on the bone of the eye socket. Next one is underneath your eyes, right on the cheekbones, the top of the cheekbones. Next one is underneath your nose. The next one is your chin. Now this one here is your collarbone point. So, you feel for your collarbone and just down in the indent of your collarbone. The next point here, for women it’s your bra strap. On the side of your body. So underneath your armpit where your bra strap is. If you’re a man, it’s about one bandwidth bellow your armpit or about four inches. So, those are the points.